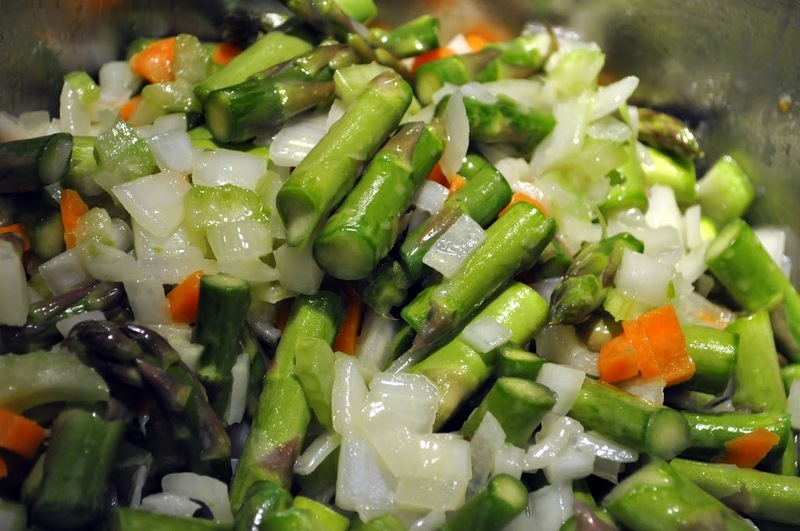 I love asparagus and have wanted to make asparagus soup for quite awhile, but it’s usually so expensive that I only buy one bunch. But, this week, our local market offered it for 99 cents a bunch, so I bought 3! And, just my luck, fresh lump crab meat was on sale, too. John made this amazing soup with a mirepoix base that’s finished with cream and served around a mound of crab souffle. It reminded me of something you’d find in a high-end tea room in London – just so simple, elegant, and delicious! 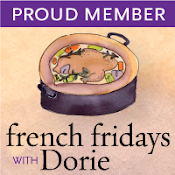 This soup was the perfect accompaniment to Saint Germain-des-Pres Onion Biscuits which is this week’s French Fridays with Dorie challenge. 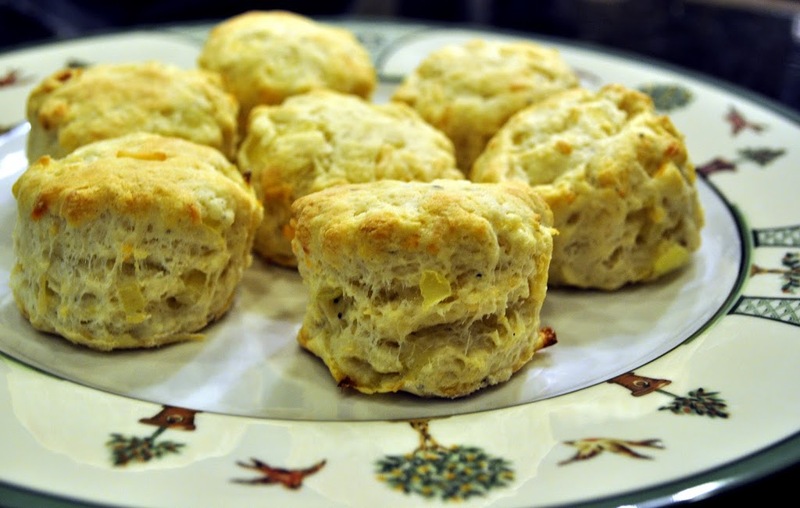 I have to confess that Dorie’s recipes are the only ones I use for making biscuits, and I make sweet and savory ones quite often for breakfast on the weekends. They rise so beautifully, and are perfectly crisp on the outside and soft on the inside. 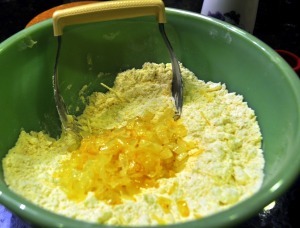 I couldn’t resist adding 1/3 cup shredded Parmesan Cheese to the dough – it was a great finishing touch. Love your entire meal! The biscuits look perfect, just curious how many did you get out of the recipe? 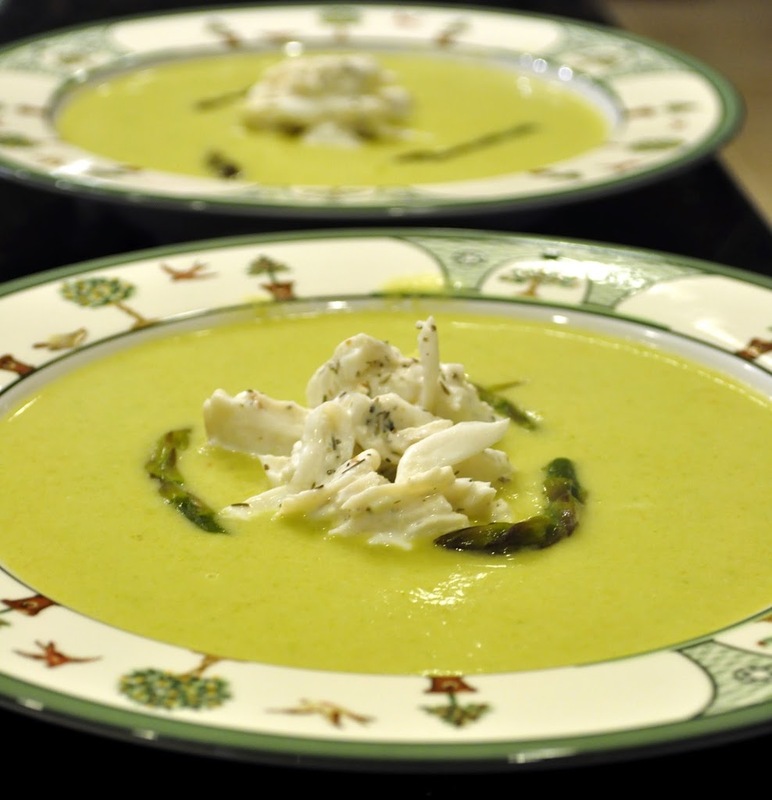 My mouth is watering for a bowl of your asparagus bisque and that crab! The photos are stunning! The asparagus with lump carb just come alive in this post. Wow! Thanks for sharing. Now I want that for dinner!! Beautiful rise on those biscuits. And the soup, well, wow. Wow. I am so impressed by those biscuits. They are so fluffy and beautiful. I’m going to bookmark your recipe. I’ve never had luck with biscuits but I’ve only tried them twice. I think when you land on a successful biscuit recipe it should be filed away securely! WOW! I need John to make his asparagus crab bisque here. Beautifully done and a perfect meal for your tea room biscuits. And they must have been so good with all that cheese added in. Great ideas. 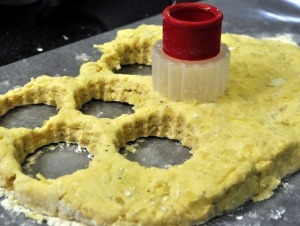 Your biscuits are perfect. rise than mine did. The idea of the cheese sounds terrific. The picture of the green soup in the bowl is perfect. Susan, I’m so thrilled you stopped by so that I may find your blog! Beautiful, beautiful photos and recipes!! I’m looking forward to browsing further. This bisque sounds amazing! Definitely need to make it very soon!! your biscuits turned out perfectly! Mine were a bit flat. The bisque looks fabulous as well. Excellent idea to add some Parm! Your biscuits look delicious! Beautiful biscuits! 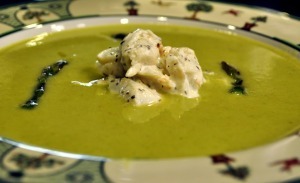 But I’m loving the crab asparagus bisque…Wow! I will definitely bookmark this one! Nicely done! Have a great weekend! Both your bisque and your biscuits look wonderful!! Great idea to add the Parmesan – I may have to steal that idea! I’ve been craving crab ever since a trip to Laguna last weekend. This looks like a match made in heaven with the crab and asparagus (biscuits too). Will definitely be trying this. Did you serve the soup hot or chilled? Thanks for the tip about the artichokes, I decided to skip them this year since I didn’t have enough room for them to grow. Oh, I definitely need to visit your house, no, I mean, spend a few months at your house. 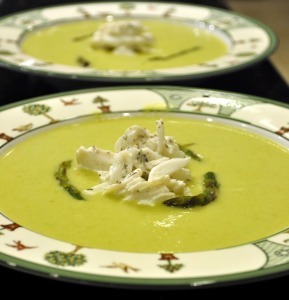 Crab asparagus bisque. We were just at our Cambria, California farmers market today and bought 3 bunches of asparagus. I think we might go your bisque route. I have more onion biscuits in the freezer (minus parmesan cheese – good idea). Nice, nice Post. The soup looks fantastic. I’m originally a Maryland girl, so anything with crab catches my eye. Your cheesy biscuits go perfectly. Have a great weekend! Great looking meal! 99 cent asparagus! Wonderful! What a gorgeous table setting, Susan. 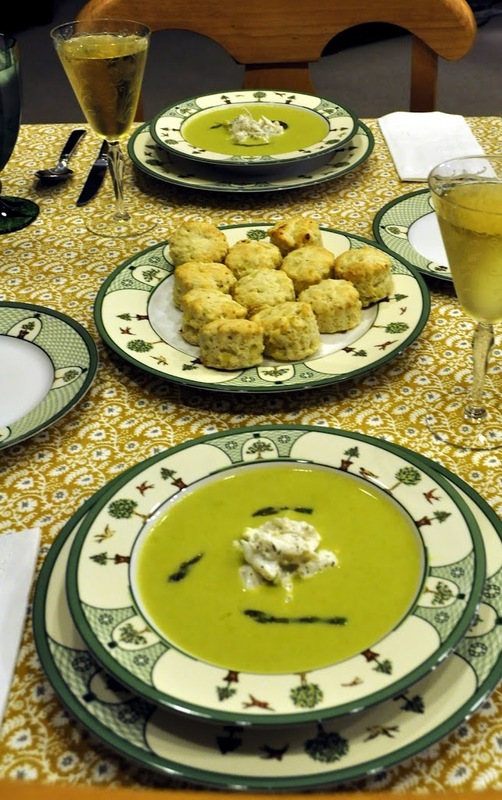 Your asparagus soup looks wonderful and so doesn’t your biscuits. They rose beautifully and I bet were extra tasty with the parmesan cheese. I am purposely not looking at your PB & J bars until tomorrow morning. I haven’t made mine yet. 😉 I have you enjoy your weekend! I always say of everyone it is YOU who I would want to cook a meal for me. You always know how to put things together. Wow. Just perfect. 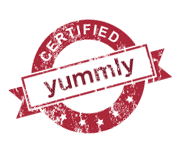 And, of course, I could not agree with you more about adding cracked pepper…something I’m now adding to everything, even desserts! My goodness, your meal looks delicious! I wish I could have eaten at your house this week. Where I live we will not start to see asparagus for another month yet, I can’t wait to start cooking with it again. Your bisque looks wonderful – the perfect accompaniment to your biscuits. Your presentation, the bisque, and the biscuits are so perfect. I love the shape of your biscuit cutter, too.